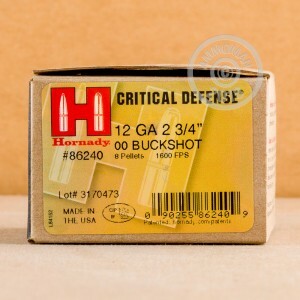 Stock up for all your self-defense needs with this powerful 12 gauge buckshot load from Hornady. 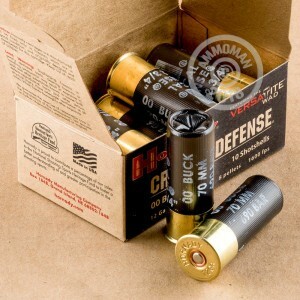 Offered in a 100 round case for quantity savings, these 2-3/4" shells propel 8 pellets of 00 buck at 1,600 feet per second for impressive knockdown power against assailants. These shells will also work very well against medium-sized game. Loaded in Grand Island Nebraska, Hornady Critical Defense shotshells are a home defense load you can count on to help you protect your home and family. 00, or "double-ought" buck, consists of lead shot about a third of an inch, or 8.4mm, wide. It is highly effective against both criminals and game, though it does penetrate sheetrock rather easily and cannot be fired without regard to what is behind the target. 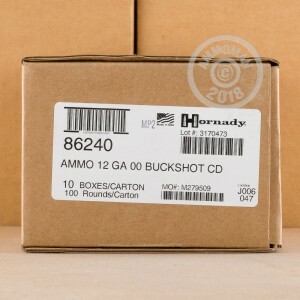 Buy these shells or any other case-priced ammo to get your order total over $99. Then head over to our convenient checkout system and wait for an exorbitant shipping and handling fee to appear... only to discover that AmmoMan ships all orders over $99 for FREE!